I’m so happy to return today with my recipe for the Secret Recipe Club! I was assigned to a beautiful blog called NY City Eats and wow, Lacy is so gourmet. She’s a professionally trained chef who graduated from The Institute of Culinary Education in 2010. Impressive! As are her recipes, and I was pretty much in awe of all the fancy ingredients she incorporates into them. (Check out this pizza video-it is so professional! And even her “simple” pizzas sound and look so fancy.) Being less of a cook, especially not a gourmet one, and more of a baker, I felt more at home when I looked through her dessert recipes, which happily were plentiful. I happened to inherit 16 pints of blueberries and a crate full of lemons from my Grandpa (long story, will tell it later), so I searched for something I could use them in from Lacy’s blog. I first ruined her recipe for Low Calorie Banana Blueberry Muffins by making it sugar-free (was testing out Swerve’s sweetener) and under-baking them. They were awful and I won’t share my adapted recipe, just visit the link for hers, which looks much better. Again on the hunt for blueberry-filled recipes, I found her Mixed Berry Bundt Cake and made my own blueberry-lemon version almost as soon as the muffins were trashed. After clicking back through all the “adapted from” links to find where the recipe originated (a difficult feat in this age of food blogs, and I gave up after five clicks), I discovered this was a lower fat version of the Elvis Presley Pound Cake I’d been wanting to try for years. It has less sugar than the original recipe I’d saved to my computer back in 2009, but I made it with the smaller amount and found it to be perfectly sweet. I did, however, use the whipping cream called for in the original recipe, rather than yogurt as I was out of yogurt and didn’t want to go to the store. The cake was buttery and dense, as a proper pound cake should be, and I loved the taste of the lemon and blueberries in it. I believe the cake would be best eaten the same day it’s baked, as it was a little dry on day two. Eating it fresh also helps the appearance, as the blueberries will be more whole (the juices get absorbed as time goes on, making them shrivel up inside the cake as in the pictures. Please check Lacy’s healthier recipe, which looks very moist and delicious. Thank you for sharing it, Lacy, I so appreciate you helping me use up some of these blueberries! And we so enjoyed eating it! Preheat oven to 350 degrees F. Grease a 9×5 loaf pan with butter and dust with flour, set aside. Cream the butter and sugar on medium-high speed for five minutes, until light, creamy and fluffy. Add eggs one at a time, mixing well after each. Mix in the vanilla. Sift in half of the flour, beat on low until blended, then add the cream and blend again until mix. Sift in the remaining flour and mix just until blended. Add the lemon zest and mix on low until incorporated and batter is smooth. Fold in the blueberries and spread batter into prepared pan. Bake in preheated oven for 55-60 minutes, or until a tester inserted in the center comes out clean. Remove from pan and cool completely on a wire rack. Once cool, whisk together 1 tablespoon of the fresh lemon juice and the powdered sugar until smooth. Drizzle over the cake and let it set for half an hour before serving. Best served same day. Click Mr. Linky below to view the other SRC Group C recipes! Posted in Cake & Frosting, Secret Recipe Club and tagged baking, blueberry lemon pound cake, recipe. Bookmark the permalink. Oops, thanks–I use a large loaf pan 9×5. The recipe I adapted was made in a bundt pan and was lighter…my evil and lazy side won with this one-lol. Can you even imagine this!? I woke up today thinking about blueberry/lemon and what could I make? I would LOVE to inherit a bunch of berries and lemons…such a great flavor combo. That bread looks absolutely mouth-watering. I’d sure love some NOW. Have a good week Friend. Veronica: This pound cake looks so moist and delicious that my mouth is watering…Love the photos! I have blueberries in the freezer and will be making this soon! Yum! And what a pretty loaf! It just looks springy! And so far, I have counted at least five lemony dessert posts for this month’s SRC. Great minds….. I noticed that too! I think we’re all thinking SPRING! LOL, don’t worry even if you were flippant it would have made me smile. :) My grandpa was a crazifer but I’m weird and kind of proud of how crazy he was with the food hoarder tendencies. What a gorgeous looking cake. My I could use a slice of that with my coffee this morning! Oh, this looks beautiful! Blueberry and lemon are so, so good together. What a great way to use up some blueberries! That is so pretty! Lemon and blueberry are delicious together! This looks awesome! Welcome spring if it ever gets here in MN!! Thankfully we can at least have spring in our kitchens! It sure is taking it’s time here too, but I’m actually OK with that. I’m enjoying winter this year. You know I’m in lemon heaven right now! I bet the leftover would make a decent french toast! Looks divine. And I love, love, love the dish that the loaf is on. Too funny we both did lemon desserts. :D Great minds, I was so close to making this into French Toast for breakfast yesterday but just didn’t have the patience and just ate a piece with milk. Thank you, I love the dish too! It’s a Hobby Lobby find. This looks so beautiful, and delicious! I love the blueberry and lemon flavor combo. Me too, I think I have at least two other recipes on my blog with the combo. The citrus really helps offset the sweetness of blueberries. This looks so good, and your picture is amazing! the pound cake looks beautiful. i love the combo of blueberries and lemon. WHOA! That is one gorgeous loaf! And I love the platter you’re using. Can’t wait to make this one….hurry up blueberry season!! I got that platter at Hobby Lobby–I seem to be collecting platters just for blogging lately and it’s getting out of hand. That one was like $7 which I didn’t think was too bad for a brand new item. Man, we seemed to be having an unseasonal blueberry season back in January, every grocery store in Wichita had them for like $1 a pint. We were eating them every day! It was so wonderful, but made me wonder who who had a bumper crop at that time of year. Ahh this looks so inviting and delicious – I love lemon & blueberries together. Lucky you for getting so many pints & crates of blueberries & lemons! This looks irresistible! Your pictures are as lovely as your pick this month! This looks delicious! What a great way to interpret the recipe! And thank you so much for the lovely write up. :) The bundt cake was one of my favorites. On a side note, I’m very sorry to hear about your grandpa. Thoughts for you and your family. Thank you, Lacy, for everything. That is absolutely beautiful! I can’t wait to try it. This is definitely one of my favorite combinations of all time – nothing beats it! Oh I can’t wait for summer fruits to come back here in New England! I love it too. Hope you get them soon! Lemon and blueberry are such a great flavor combo. Your cake looks delish with that glaze dripping off the sides. Looks like breakfast to me! Now if I only I had some. What a great recipe and looks super tasty. I could eat 2 or three slices. Glad to be part of SRC group C with you! Thanks so much! I did eat 2 or three and then had to take it to work lest I eat the whole thing! This looks so lovely! I could go for a piece right now…love how it bursts with blueberries! 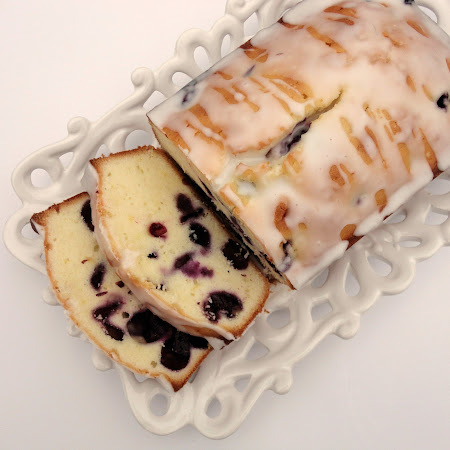 Yum, love the combo of lemon and blueberries, your pound cake looks delicious! That looks awesome, great flavors together. I love anything with lemon and blueberries! It looks delicious!